I’ve decided to do this in two parts, the reason for this is that the faults to this board are so extensive. I am convinced that this board was hit by a bolt of lightning. 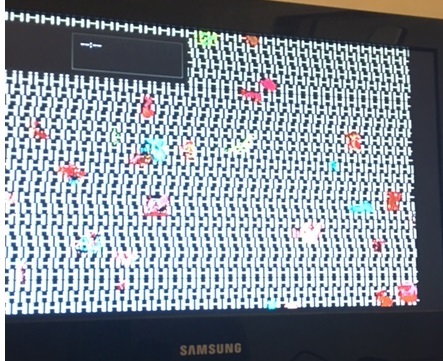 Symptoms – game booting to a screen full of zeros and watchdog barking. Z80s reset pin was also asserting but the sequence was incorrect ( just a hi flashing signal on the logic probe with no low ). There was also a perpetual low frequency sound with a higher pitched sound superimposed on top of that. Did the usual troubleshooting. +5.15v voltage at the edge and 4.5v at the chips. Thought this was a little low. Something is dragging it down, I decide not to panic too much. A previous repair was attempted so I decided to check all the socketed chips out of circuit first before proceeding with my own troubleshooting. Brand new components H16,E12,G17,G18 and the 74LS245 at H17 tested good. All EPROMs on the top board checked out fine with romident. The owner of the board mentioned that the board was activating the coin meter on its own, then that eventually stopped. I take a stab at the 74LS08 at A2 which seems to drive COIN 2. My logic probe registers dead outputs on the chip and it tests bad out of circuit too. Of course changing it made no difference to how the game runs. 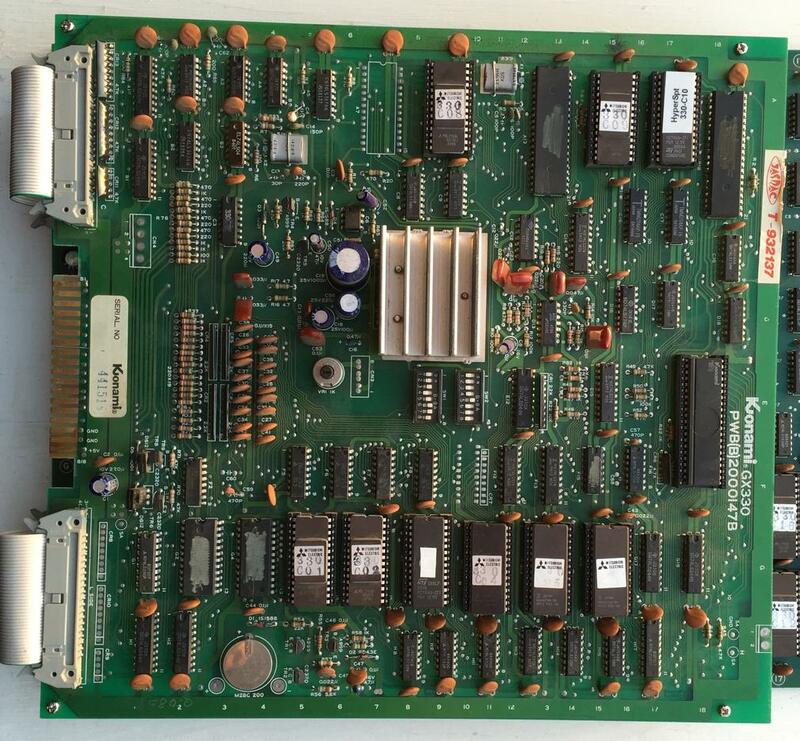 I would soon discover that the 74ls08 seems to be a high failure Fujitsu component in this board. I wanted to check out what was going on with the strange reset behavior of the Z80 reset line first.I remove D18 and test it out of circuit, sure enough it tests bad so I replace it. This fixes the reset signal and it’s now going from low to high as expected. Half the pins on the z80 are floating and the data lines aren’t toggling so I remove it and install a replacement from a parts board. The new z80 is alive although not for long before the CPU crashes and the data lines get stuck again. At some point in the repair the Z80’s data lines stopped toggling again from an initial reset. I traced this to stuck enables on the LS138 at C18 which tested fine out of circuit but the 74LS08 at C9 feeding /G2A on C18 actually failed. Replacing C9 fixed it again. I still had stuck /OEs on both sound EPROMs but I would look at this issue later. For some reason A16 on the bottom board caught my attention, of course this was a Fujitsu branded 74LS08 as well. I had a brand new one in my hand so I thought “what the hell” and piggy backed the new one on top of it. This seems to have cleared the screen with the initial junk. I also found another bad 74LS08 at H2 which changed nothing after replacing it. I also found 4 additional bad chips @ F13, E15,C12 & C14 and replaced those with no obvious change. With pin 19 barking furiously I decided to trace it’s origin thinking that perhaps there was a problem with the watchdog. Both /E and /Q clock frequencies were correct on the CPU ( 1.53Mhz ) . I found a bad resistor at r43 ( measured 2kohms instead of 1kohm ) so I replaced it, no change.The reset signal actually originates from the bottom board .I traced and tested every chip in it’s path starting from the Konami1. ( top board [D18, B2 then the CR13 connector], bottom board [A1,G2,C4, 504 ]. G2 ( Another Fujitsu 74LS08 ) tested bad, replacing it didn’t change anything after testing. I was starting to lose confidence at this point. 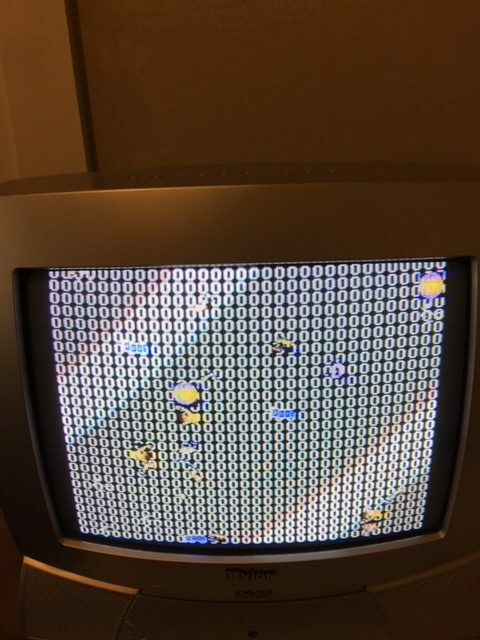 I started to probe the /OE enables to the game EPROMs and saw that every single output was stuck high right from reset. Pins 4 and 5 ( /G2A and /G2B ) of the LS138 @ H16 were floating. For y0-y7 output to go active low, the two above mentioned inputs must be low. 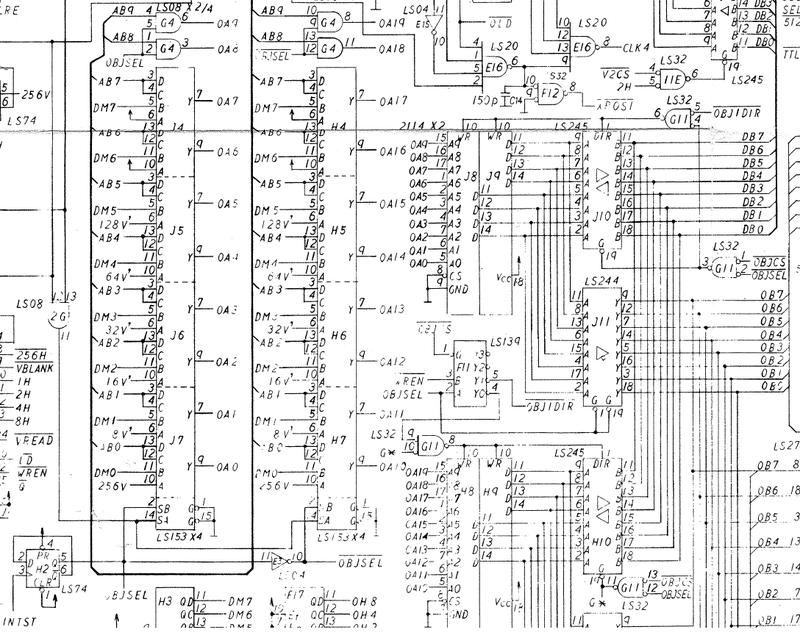 Since pins 4 & 5 are tied together I traced this back to pin 28 output of the Konami1. I replaced the CPU temporarily with mine from my Gyruss PCB and now I was getting a screen full of Hs, This meant that the CPU was actually executing code from ROM. I installed the original CPU back into the PCB and measured around 1v on the inputs of pins 4 & 5 of the LS138. I would soon discover that the CPU was faulty on this line only. This CPU actually works fine in my Gyruss board [ Gyruss does not use the output of pin 28 of the Konami1 ]. So I added a 1kohm pull down resistor between pins 4,5 and ground on the LS138. 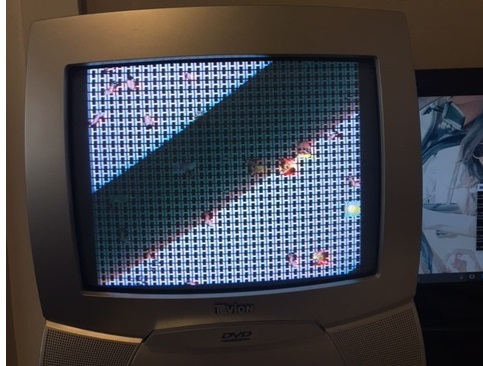 This pulled the 1v down to more acceptable TTL levels and I finally got this CPU to boot to the screen full of Hs just as you see above with the good CPU. The sprite colours now seem to be showing incorrectly with red streaks compared with the last screenshot. I installed my testrom into G15 which showed that the main RAM at G2 was bad. I removed the RAM, socketed the board but the RAM tested good in my TopMax. I probed the RAM with my logic probe and saw no write enable active at all. That would do it! It seems there was a broken trace right near pin 8 of H11 when removing the chip, this was the write enable output to the main RAM. Reconnecting this line fixed the RAM error. The game was finally able to boot with the typical HS issues. This ended up being bad 2114s on the top board ( C16 & C17 ). After replacing these I now had sound but unfortunately speech isn’t working. The data lines on the chip are all floating and there seems to be no clock at all. At this point it looks like a bad VLM5030 chip which I’ll have to look at later when I can get a spare. 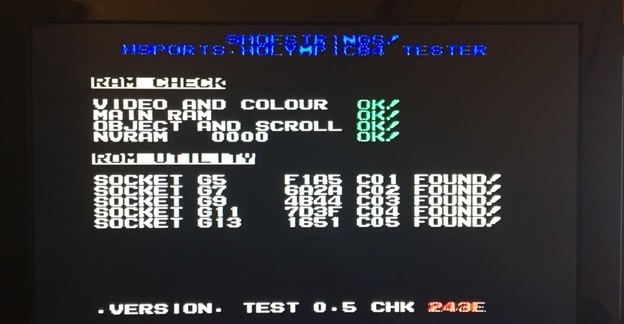 Replacing all four 2114s on the bottom board fixed the flickering but the colour issue still remained. I removed all bipolar PROMs and they all had the wrong checksums. So I’m going to order some and hope to fix the that also. 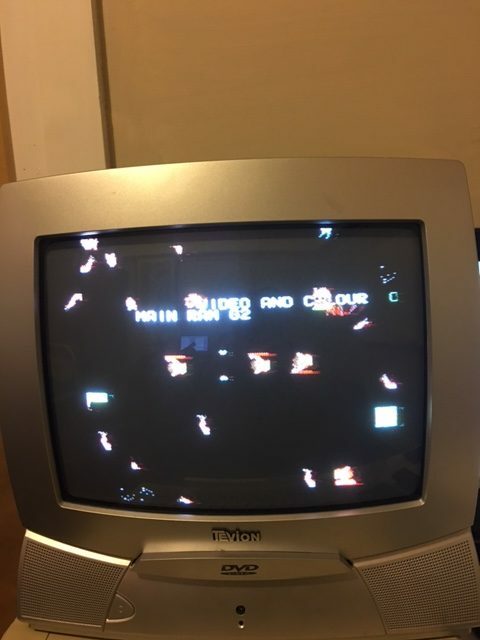 I’ve also decided to start using my LCD instead of the CRT which seems to have some issues displaying colours at the correct position near the edges of the screen. After replacing the 2114 rams the Hs look a little wonky and there are some still random sprites. I’m hoping this is normal though. I’m guessing it is since the game code hasn’t had the chance to clear the object and scroll ram so it probably takes on some random values causing the wonkyness and random sprites before proper initialization takes place. 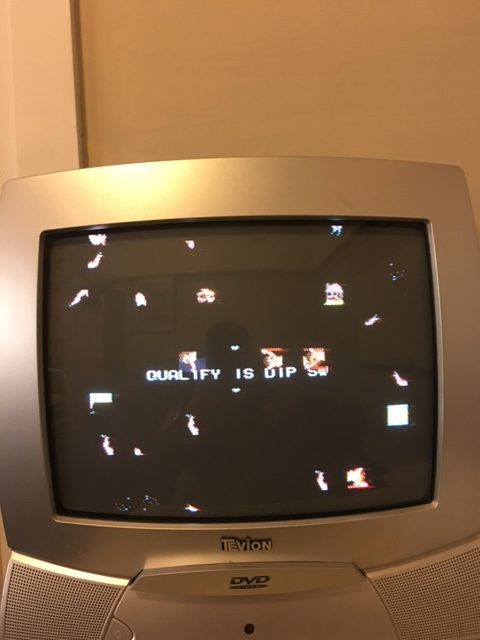 I wrote some code to test this and I was able to clear the screen correctly after setting up and enabling the IRQ, then writing 0s from 0x1000 – 0x13ff within the interrupt routine. The results are more than I could have hoped for. I went through a lot of “boards from Hell” few months ago. It was a lot on my nerves but finally managed to repair them.